For other people named Henry Cavendish, see Henry Cavendish (disambiguation). Henry Cavendish FRS (/ˈkævəndɪʃ/; 10 October 1731 – 24 February 1810) was an English natural philosopher, scientist, and an important experimental and theoretical chemist and physicist. He is noted for his discovery of hydrogen, which he termed "inflammable air". He described the density of inflammable air, which formed water on combustion, in a 1766 paper, On Factitious Airs. Antoine Lavoisier later reproduced Cavendish's experiment and gave the element its name. A notoriously shy man (it has been postulated that he had what is now called childhood autism in the ICD-10), Cavendish was nonetheless distinguished for great accuracy and precision in his researches into the composition of atmospheric air, the properties of different gases, the synthesis of water, the law governing electrical attraction and repulsion, a mechanical theory of heat, and calculations of the density (and hence the mass) of the Earth. His experiment to measure the density of the Earth has come to be known as the Cavendish experiment. Henry Cavendish was born on 10 October 1731 in Nice, where his family was living at the time. His mother was Lady Anne de Grey, fourth daughter of Henry Grey, 1st Duke of Kent, and his father was Lord Charles Cavendish, the third son of William Cavendish, 2nd Duke of Devonshire. The family traced its lineage across eight centuries to Norman times, and was closely connected to many aristocratic families of Great Britain. Henry's mother died in 1733, three months after the birth of her second son, Frederick, and shortly before Henry's second birthday, leaving Lord Charles Cavendish to bring up his two sons. From the age of 11 Henry attended Newcome's School, a private school near London. At the age of 18 (on 24 November 1748) he entered the University of Cambridge in St Peter's College, now known as Peterhouse, but left three years later on 23 February 1751 without taking a degree (at the time, a common practice). He then lived with his father in London, where he soon had his own laboratory. Lord Charles Cavendish spent his life firstly in politics and then increasingly in science, especially in the Royal Society of London. In 1758, he took Henry to meetings of the Royal Society and also to dinners of the Royal Society Club. In 1760, Henry Cavendish was elected to both these groups, and he was assiduous in his attendance after that. He took virtually no part in politics, but followed his father into science, through his researches and his participation in scientific organisations. He was active in the Council of the Royal Society of London (to which he was elected in 1765). His interest and expertise in the use of scientific instruments led him to head a committee to review the Royal Society's meteorological instruments and to help assess the instruments of the Royal Greenwich Observatory. His first paper, Factitious Airs, appeared in 1766. Other committees on which he served included the committee of papers, which chose the papers for publication in the Philosophical Transactions of the Royal Society, and the committees for the transit of Venus (1769), for the gravitational attraction of mountains (1774), and for the scientific instructions for Constantine Phipps's expedition (1773) in search of the North Pole and the Northwest Passage. In 1773, Henry joined his father as an elected trustee of the British Museum, to which he devoted a good deal of time and effort. 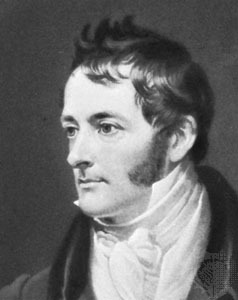 Soon after the Royal Institution of Great Britain was established, Cavendish became a manager (1800) and took an active interest, especially in the laboratory, where he observed and helped in Humphry Davy's chemical experiments. About the time of his father's death, Cavendish began to work closely with Charles Blagden, an association that helped Blagden enter fully into London's scientific society. In return, Blagden helped to keep the world at a distance from Cavendish. Cavendish published no books and few papers, but he achieved much. Several areas of research, including mechanics, optics, and magnetism, feature extensively in his manuscripts, but they scarcely feature in his published work. Cavendish is considered to be one of the so-called pneumatic chemists of the eighteenth and nineteenth centuries, along with, for example, Joseph Priestley, Joseph Black, and Daniel Rutherford. Cavendish found that a definite, peculiar, and highly inflammable gas, which he referred to as "Inflammable Air", was produced by the action of certain acid on certain metals. This gas was, in fact, hydrogen, which Cavendish correctly guessed was proportioned to two in one water. Although others, such as Robert Boyle, had prepared hydrogen gas earlier, Cavendish is usually given the credit for recognising its elemental nature. Also, by dissolving alkalis in acids, Cavendish made "fixed air" (carbon dioxide), which he collected, along with other gases, in bottles inverted over water or mercury. He then measured their solubility in water and their specific gravity, and noted their combustibility. Cavendish was awarded the Royal Society's Copley Medal for this paper. Gas chemistry was of increasing importance in the latter half of the 18th century, and became crucial for Frenchman Antoine-Laurent Lavoisier's reform of chemistry, generally known as the chemical revolution. In 1783, Cavendish published a paper on eudiometry (the measurement of the goodness of gases for breathing). 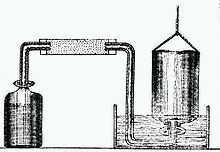 He described a new eudiometer of his invention, with which he achieved the best results to date, using what in other hands had been the inexact method of measuring gases by weighing them. He next published a paper on the production of water by burning inflammable air (that is, hydrogen) in "dephlogisticated air" (now known to be oxygen), the latter a constituent of atmospheric air (phlogiston theory). Cavendish concluded that dephlogisticated air was dephlogisticated water and that hydrogen was either pure phlogiston or phlogisticated water. He reported these findings to Joseph Priestley, an English clergyman and scientist, no later than March 1783, but did not publish them until the following year. The Scottish inventor James Watt published a paper on the composition of water in 1783; Cavendish had performed the experiments first, but published second. Controversy about priority ensued. In 1785, Cavendish investigated the composition of common (i.e. atmospheric) air, obtaining impressively accurate results. He conducted experiments in which hydrogen and ordinary air were combined in known ratios and then exploded with a spark of electricity. Furthermore, he also described an experiment in which he was able to remove, in modern terminology, both the oxygen and nitrogen gases from a sample of atmospheric air until only a small bubble of unreacted gas was left in the original sample. Using his observations, Cavendish observed that, when he had determined the amounts of phlogisticated air (nitrogen) and dephlogisticated air (oxygen), there remained a volume of gas amounting to 1/120 of the original volume of nitrogen. By careful measurements he was led to conclude that "common air consists of one part of dephlogisticated air [oxygen], mixed with four of phlogisticated [nitrogen]". In the 1890s (around 100 years later) two British physicists, William Ramsay and Lord Rayleigh, realised that their newly discovered inert gas, argon, was responsible for Cavendish's problematic residue; he had not made an error. What he had done was perform rigorous quantitative experiments, using standardised instruments and methods, aimed at reproducible results; taken the mean of the result of several experiments; and identified and allowed for sources of error. The balance that he used, made by a craftsman named Harrison, was the first of the precision balances of the 18th century, and as accurate as Lavoisier's (which has been estimated to measure one part in 400,000). Cavendish worked with his instrument makers, generally improving existing instruments rather than inventing wholly new ones. Cavendish, as indicated above, used the language of the old phlogiston theory in chemistry. In 1787, he became one of the earliest outside France to convert to the new antiphlogistic theory of Lavoisier, though he remained sceptical about the nomenclature of the new theory. He also objected to Lavoisier's identification of heat as having a material or elementary basis. Working within the framework of Newtonian mechanism, Cavendish had tackled the problem of the nature of heat in the 1760s, explaining heat as the result of the motion of matter. In 1783, he published a paper on the temperature at which mercury freezes and in that paper made use of the idea of latent heat, although he did not use the term because he believed that it implied acceptance of a material theory of heat. He made his objections explicit in his 1784 paper on air. He went on to develop a general theory of heat, and the manuscript of that theory has been persuasively dated to the late 1780s. His theory was at once mathematical and mechanical: it contained the principle of the conservation of heat (later understood as an instance of conservation of energy) and even included the concept (although not the label) of the mechanical equivalent of heat. Following his father's death, Henry bought another house in town and also a house in Clapham Common (built by Thomas Cubitt), at that time to the south of London. The London house contained the bulk of his library, while he kept most of his instruments at Clapham Common, where he carried out most of his experiments. The most famous of those experiments, published in 1798, was to determine the density of the Earth and became known as the Cavendish experiment. The apparatus Cavendish used for weighing the Earth was a modification of the torsion balance built by Englishman and geologist John Michell, who died before he could begin the experiment. The apparatus was sent in crates to Cavendish, who completed the experiment in 1797–1798 and published the results. The experimental apparatus consisted of a torsion balance with a pair of 2-inch 1.61-pound lead spheres suspended from the arm of a torsion balance and two much larger stationary lead balls (350 pounds). Cavendish intended to measure the force of gravitational attraction between the two. He noticed that Michell's apparatus would be sensitive to temperature differences and induced air currents, so he made modifications by isolating the apparatus in a separate room with external controls and telescopes for making observations. Using this equipment, Cavendish calculated the attraction between the balls from the period of oscillation of the torsion balance, and then he used this value to calculate the density of the Earth. Cavendish found that the Earth's average density is 5.48 times greater than that of water. John Henry Poynting later noted that the data should have led to a value of 5.448, and indeed that is the average value of the twenty-nine determinations Cavendish included in his paper. What was extraordinary about Cavendish's experiment was its elimination of every source of error and every factor that could disturb the experiment, and its precision in measuring an astonishingly small attraction, a mere 1/50,000,000 of the weight of the lead balls. The result that Cavendish obtained for the density of the Earth is within 1 percent of the currently accepted figure. Books often describe Cavendish's work as a measurement of either G or the Earth's mass. Since these are related to the Earth's density by a trivial web of algebraic relations, none of these sources are wrong, but they do not match the exact word choice of Cavendish, and this mistake has been pointed out by several authors. Cavendish's stated goal was to measure the Earth's density, although his result obviously calculates G to do so. The first time that the constant got this name was in 1873, almost 100 years after the Cavendish experiment, but the constant was in use since the time of Newton. Cavendish's results also give the Earth's mass. Cavendish's electrical and chemical experiments, like those on heat, had begun while he lived with his father in a laboratory in their London house. Lord Charles Cavendish died in 1783, leaving almost all of his very substantial estate to Henry. Like his theory of heat, Cavendish's comprehensive theory of electricity was mathematical in form and was based on precise quantitative experiments. He published an early version of his theory in 1771, based on an expansive electrical fluid that exerted pressure. He demonstrated that if the intensity of electric force were inversely proportional to distance, then the electric fluid more than that needed for electrical neutrality would lie on the outer surface of an electrified sphere; then he confirmed this experimentally. Cavendish continued to work on electricity after this initial paper, but he published no more on the subject. Cavendish wrote papers on electrical topics for the Royal Society but the bulk of his electrical experiments did not become known until they were collected and published by James Clerk Maxwell a century later, in 1879, long after other scientists had been credited with the same results. Cavendish's electrical papers from the Philosophical Transactions of the Royal Society of London have been reprinted, together with most of his electrical manuscripts, in The Scientific Papers of the Honourable Henry Cavendish, F.R.S. (1921). According to the 1911 edition of Encyclopædia Britannica, among Cavendish's discoveries were the concept of electric potential (which he called the "degree of electrification"), an early unit of capacitance (that of a sphere one inch in diameter), the formula for the capacitance of a plate capacitor, the concept of the dielectric constant of a material, the relationship between electric potential and current (now called Ohm's Law) (1781), laws for the division of current in parallel circuits (now attributed to Charles Wheatstone), and the inverse square law of variation of electric force with distance, now called Coulomb's Law. Cavendish died in 1810 (as one of the wealthiest men in Britain) and was buried, along with many of his ancestors, in the church that is now Derby Cathedral. The road he used to live on in Derby has been named after him. The University of Cambridge's Cavendish Laboratory was endowed by one of Cavendish's later relatives, William Cavendish, 7th Duke of Devonshire (Chancellor of the University from 1861 to 1891). Cavendish inherited two fortunes that were so large that Jean Baptiste Biot called him "the richest of all the savants and the most knowledgeable of the rich." At his death, Cavendish was the largest depositor in the Bank of England. He was a shy man who was uncomfortable in society and avoided it when he could. He could only speak to one person at a time, and only if the person were known to him and male. He conversed little, always dressed in an old-fashioned suit, and developed no known deep personal attachments outside his family. Cavendish was taciturn and solitary and regarded by many as eccentric. He only communicated with his female servants by notes. By one account, Cavendish had a back staircase added to his house to avoid encountering his housekeeper, because he was especially shy of women. The contemporary accounts of his personality have led some modern commentators, such as Oliver Sacks, to speculate that he had Asperger syndrome, a form of autism. His only social outlet was the Royal Society Club, whose members dined together before weekly meetings. Cavendish seldom missed these meetings, and was profoundly respected by his contemporaries. However, his shyness made those who "sought his views... speak as if into vacancy. If their remarks were...worthy, they might receive a mumbled reply, but more often than not they would hear a peeved squeak (his voice appears to have been high-pitched) and turn to find an actual vacancy and the sight of Cavendish fleeing to find a more peaceful corner". Cavendish's religious views were also considered eccentric for his time. He was considered to be agnostic. As his biographer, George Wilson, comments, "As to Cavendish's religion, he was nothing at all." He also enjoyed collecting fine furniture, exemplified by his purchase of a set of "ten inlaid satinwood chairs with matching cabriole legged sofa". Because of his asocial and secretive behaviour, Cavendish often avoided publishing his work, and much of his findings were not even told to his fellow scientists. In the late nineteenth century, long after his death, James Clerk Maxwell looked through Cavendish's papers and found things for which others had been given credit. Examples of what was included in Cavendish's discoveries or anticipations were Richter's law of reciprocal proportions, Ohm's law, Dalton's law of partial pressures, principles of electrical conductivity (including Coulomb's law), and Charles's Law of gases. A manuscript "Heat", tentatively dated between 1783 and 1790, describes a "mechanical theory of heat". Hitherto unknown, the manuscript was analysed in the early 21st century. Historian of science Russell McCormmach proposed that "Heat" is the only 18th-century work prefiguring thermodynamics. Theoretical physicist Dietrich Belitz concluded that in this work Cavendish "got the nature of heat essentially right." As Cavendish performed his famous density of the Earth experiment in an outbuilding in the garden of his Clapham Common estate, his neighbours would point out the building and tell their children that it was where the world was weighed. In honour of Henry Cavendish's achievements and due to an endowment granted by Henry's relative William Cavendish, 7th Duke of Devonshire, the University of Cambridge's physics laboratory was named the Cavendish Laboratory by James Clerk Maxwell, the first Cavendish Professor of Physics and an admirer of Cavendish's work. ^ a b Cavendish, Henry (1766). "Three Papers Containing Experiments on Factitious Air, by the Hon. Henry Cavendish". Philosophical Transactions of the Royal Society. The University Press. 56: 141–184. doi:10.1098/rstl.1766.0019. Retrieved 6 November 2007. ^ Silberman, Steve, NeuroTribes: The Legacy of Autism and the Future of Neurodiversity, pp. 38–39, Allen & Unwin, 2015 ISBN 176011362X. ^ "Cavendish, Henry (CVNS749H)". A Cambridge Alumni Database. University of Cambridge. ^ Wilson, George (1851). "1". The life of the Hon. Henry Cavendish. Cavendish Society. p. 17. ^ Singer, Charles (1966). Short History of Scientific Ideas to 1900. Oxford University Press: Oxford at the Clarendon Press. pp. 337–339. ^ David Philip Miller (2004). Discovering water: James Watt, Henry Cavendish, and the nineteenth century 'Water Controversy'. Ashgate Publishing. p. 42. ISBN 978-0-7546-3177-4. Quoting from the monograph by James Riddick Partington, The Composition of Water, G. Bell and Sons, 1928, OCLC 3590255. ^ See page 382 of Cavendish, Henry (1785). "Experiments on Air". Philosophical Transactions of the Royal Society. 75: 372–384. Bibcode:1785RSPT...75..372C. doi:10.1098/rstl.1785.0023. The same passage is on page 50 of the Alembic Club reprint of the article. ^ A. Truman Schwartz, Chemistry: Imagination and Implication, p.96, Elsevier, 2012 ISBN 0323145116. ^ See page 376 of Cavendish, Henry (1785). "Experiments on Air". Philosophical Transactions of the Royal Society. 75: 372–384. Bibcode:1785RSPT...75..372C. doi:10.1098/rstl.1785.0023. The same passage is on page 44 of the Alembic Club reprint of the article. ^ Lambeth Libraries. "Cavendish House, Clapham Common South Side". Europeana Collections 1914-1918. Connecting Europe Facility. European Union. Retrieved 11 April 2019. ^ a b c Bryson, B. (2003), "The Size of the Earth": A Short History of Nearly Everything, 59–62. ^ Cavendish, Henry (1798). "Experiments to Determine the Density of Earth". Philosophical Transactions of the Royal Society. 88: 469–526. doi:10.1098/rstl.1798.0022. JSTOR 106988. ^ Magie, William Francis. A Source Book in Physics. Cambridge, MA: Harvard University Press. p. 107. ^ Poynting, J. H. (1894), "The Mean Density of the Earth" London: Charles Griffin and Company, page 45. ^ Cavendish, Henry, "Experiments to Determine the Density of the Earth", reprinted in A Source Book in Geology, K. F. Mather and S. L. Mason, editors, New York: McGraw-Hill (1939), pp. 103–107. ^ Brush, Stephen G.; Holton, Gerald James (2001). Physics, the human adventure: from Copernicus to Einstein and beyond. New Brunswick, NJ: Rutgers University Press. p. 137. ISBN 0-8135-2908-5. ^ Tipler, P. A. and Mosca, G. (2003), Physics for Scientists and Engineers: Extended Version, W. H. Freeman ISBN 0-7167-4389-2. ^ Clotfelter, B.E. (1987). "The Cavendish Experiment as Cavendish Knew It". American Journal of Physics. 55 (3): 210–213. Bibcode:1987AmJPh..55..210C. doi:10.1119/1.15214. ^ Falconer, I. (1999). "Henry Cavendish: the man and the measurement". Measurement Science and Technology. 10 (6): 470–477. Bibcode:1999MeScT..10..470F. doi:10.1088/0957-0233/10/6/310. ^ Cornu, A. and Baille, J. B. (1873), Mutual determination of the constant of attraction and the mean density of the earth, C. R. Acad. Sci., Paris Vol. 76, 954–958. ^ Cavendish, Henry (1771). "An Attempt to Explain Some of the Principal Phaenomena of Electricity, by means of an Elastic Fluid". Philosophical Transactions of the Royal Society. 61: 564–677. doi:10.1098/rstl.1771.0056. ^ Cavendish, Henry (1776). "An Account of Some Attempts to Imitate the Effects of the Torpedo by Electricity". Philosophical Transactions of the Royal Society. 66: 195–225. doi:10.1098/rstl.1776.0013. ^ Fleming, John Ambrose (1911). "Electricity" . In Chisholm, Hugh (ed.). Encyclopædia Britannica. 9 (11th ed.). Cambridge University Press. p. 192. ^ James Clerk Maxwell, ed., The Electrical Researches of the Honourable Henry Cavendish... (Cambridge, England: Cambridge University Press, 1879), pages 104–113: "Experiments on Electricity: Experimental determination of the law of electric force". Page 110: "Hence it follows that the electric attraction and repulsion must be inversely as the square of the distance..."
^ Sacks, Oliver (9 October 2001). "Henry Cavendish: An early case of Asperger's syndrome?". Neurology. 57 (7): 1347. doi:10.1212/wnl.57.7.1347. PMID 11591871. Retrieved 17 August 2016. ^ Dan Barker (2011). The Good Atheist: Living a Purpose-Filled Life Without God. Ulysses Press. p. 170. ISBN 9781569758465. He did not attend church and was considered an agnostic. "As to Cavendish's religion, he was nothing at all", writes his biographer Dr. G. Wilson. ^ George Wilson (1851). The life of the Hon. Henry Cavendish: including abstracts of his more important scientific papers, and a critical inquiry into the claims of all the alleged discoverers of the composition of water. Printed for the Cavendish Society. pp. 181–185. A Fellow of the Royal Society, who had good means of judging, states that, "As to Cavendish's religion, he was nothing at all. The only subjects in which he appeared to take any interest, were scientific. ..." ...From what has been stated, it will appear that is would be vain to assert that we know with any certainty what doctrine Cavendish held concerning Spiritual things; but we may with some confidence affirm, that the World to come did not engross his thoughts; that he gave no outward demonstration of interest in religion, and did join his fellow men in worshipping God. ...He died and have no sign, rejecting human sympathy, and leaving us no means of determining whether he anticipated annihilation, or looked forward to an endless life. ...He did not love; he did not hate; he did not hope; he did not fear; he did not worship as others do. He separated himself from his fellow men, and apparently from God. ^ a b McCormmach, R and Jungnickel, C (1996), Cavendish, American Philosophical Society, Philadelphia, ISBN 0-87169-220-1, pp. 242, 337. ^ Russell McCormmach (2004). Speculative truth: Henry Cavendish, natural philosophy, and the rise of modern theoretical science. Oxford University Press. pp. vii, 151, and 195. ISBN 978-0-19-516004-8. Cavendish: The Experimental Life (Second revised edition 2016), Christa Jungnickel and Russell McCormmach, Max Planck Research Library for the History and Development of Knowledge, 2016, ISBN 978-3-945561-06-5, 596 pp, (available online for free). Chisholm, Hugh, ed. (1911). "Cavendish, Henry" . Encyclopædia Britannica (11th ed.). Cambridge University Press. Osborne Reynolds FRS was a prominent Irish-born British innovator in the understanding of fluid dynamics. Separately, his studies of heat transfer between solids and fluids brought improvements in boiler and condenser design. He spent his entire career at what is now the University of Manchester. Paul Karl Ludwig Drude was a German physicist specializing in optics. He wrote a fundamental textbook integrating optics with Maxwell's theories of electromagnetism. "An Experimental Enquiry Concerning the Source of the Heat which is Excited by Friction" (1798), which was published in the Philosophical Transactions of the Royal Society, is a scientific paper by Benjamin Thompson, Count Rumford that provided a substantial challenge to established theories of heat and began the 19th century revolution in thermodynamics.